That is as far as Democrats art appreciation goes. Maxine Waters said it was a “masterpiece.” Should this hideous thing be thrown in a fire with plenty of gasoline? WASHINGTON: A federal judge has rejected Rep. William Lacy Clay’s legal attempt to re-hang a controversial painting on the wall of a tunnel connecting the U.S. Capitol with a House office building. John D. Bates, a judge in the District Court for the District of Columbia, ruled that “Untitled #1,” a painting by former Cardinal Ritter College Prep student David Pulphus, was government speech, and therefore was legally removed by members of Congress who objected to its content. 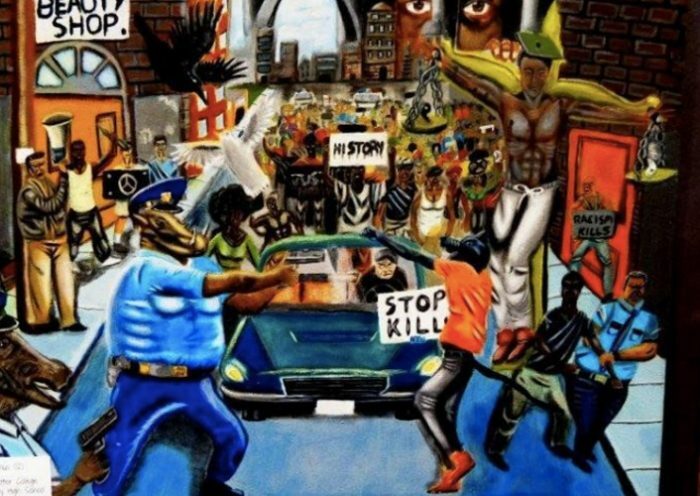 The painting depicts police officers as animals and has symbolic references to the 2014 shooting death of Michael Brown in Ferguson by police officer Darren Wilson. The officer was cleared of wrongdoing in federal and state investigations and the case created violent confrontations between demonstrators and police. It led the U.S. Justice Department under former President Barack Obama to impose reforms on Ferguson police and courts.